Research has shown that some of the happiest years a human can experience occur during retirement. So long as finances are in order, retired folk can spend their days at leisure, pottering around in the garden, visiting far-flung destinations or spending hours in the garage covering a VW Beetle in oak. That's exactly what 71-year-old Bosnian Momir Bojic did when he found himself with a glut of spare time on his hands. 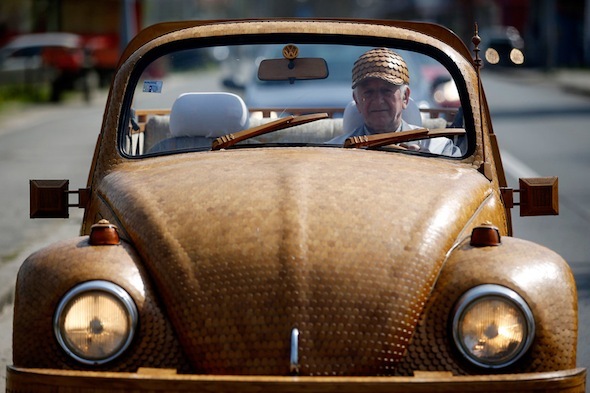 In 2005, he set about wrapping an old Beetle in wood and after two years of hard graft, this is the result. Over 50,000 pieces of solid oak were required to complete the project that sees everything from the hubcaps, windscreen wipers and dashboard to sections of the rear lights covered in polished bits of tree. There is no word on how much weight it adds to the Beetle's already strained 1.3-litre engine but the car runs and Mr Bojic can regularly be seen cruising around his local town in the eye-catching design. Take a look at the gallery below, which brilliantly highlights the attention to detail and painstaking levels of craftsmanship that have been invested into this bonkers Bug. He even wears a matching wooden baseball cap.